The Metro Radio Arena is the North East's largest entertainment venue. With a capacity of over 11,000, it has played host to world famous acts such as Oasis and Elton John. As well as concerts they also show comedy acts, ice shows and exhibitions. Do you work at Metro Radio Arena? Entry fee varies, please contact venue for further details. 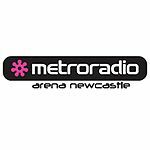 What did you think of Metro Radio Arena?